The weather did improve slightly for part of our last week at Cotton Tree and we did manage a few trips to the beach. As far as the weather goes this was the wettest and coldest Christmas we have experienced for many years. Of course in true Parfitt tradition, we didn't let the weather dampen our enthusiasm. It sure was a busy old week. We did a quick dash to Brisbane to see Ken, Sue and the girls for lunch. They had planned to come up the coast for the day but you guessed it, it rained so we thought they would have more room in their house than our van on a wet and windy day. We had a lovely day and it was great to see them again. Harry spent most of his 3 weeks at Cotton Tree at either Trevor and Desley's or over at Jim and Jenny's (our neighbours in the caravan park). These guys spoil both Harry and Alex beyond belief and both the boys love spending time with them. I would have loved to be a fly on the wall as Harry spent endless hours telling Desley all about his big adventure (she has the patience of a saint). I even came into our van one day to find him showing Desley our map of Australia and the places we stayed. Absolutely priceless. Jill and Matt came up from Brisbane for the night on Thursday. Matt and the boys played while Chris and Jill did what all girls do best, talk and talk and talk. As with all of Jill's visits we had plenty of laughs (most at Jill's expense) and it was good to see them both again. Earlier in the week Chris was shopping at the Plaza when purely by accident she bumped into Alison. 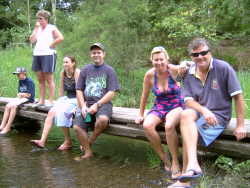 We first met Geoff and Alison at Albany and saw them again at the 'Giant Tree TopWalk' where we camped together. We had totally forgotten that they lived on the coast so arranged to catch up with them. They dropped over one day and then we went to their place for lunch. It was really good to catch up and to share some travelling stories. 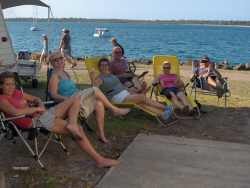 They have just bought a new 4x4 ute and an excellent tray back camper and now intend to do some more remote travelling, the places they couldn't get to in their motorhome. I can't wait to hear stories of their future adventures. What a lovely and interesting couple. These guys have just returned home after spending 4 years on the wallaby. The stories they could tell would fill a book and would make great reading. So other than a bit of shopping that was pretty much it for our stay at Cotton Tree. As per usual what makes our time here so special is the people. Although we either have no or limited contact with these people throughout the year, we all get on extremely well and have a great time together. Bruce (old cranky pants), Michelle and their son Aaron also deserve a mention. Not because they continually try and outdo us in the 'Christmas Lights' (try hards) but because they too are great company and we really look forward to seeing them each year. So after all the goodbyes we shifted out of the caravan park and ventured 7 kms up the road to stay with James, Jackie and their two kids. 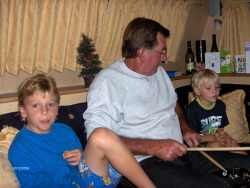 These are the guys we stayed with last month at the 'wombat infested' free camp. We first met them in Perth and have seen them a number of times since. They have been home a whole one week and are attempting to settle back into normal life. They have a lovely place set on acreage so finding a bit of flat ground for the van was easy. We ended up spending 2 nights with them. Unfortunately Mick had to work this week so Jo and the boys made their first maiden voyage with the van. Jo looked a tad stressed on arriving so I found a nice level spot and backed in the van and helped set it up. Jo then opened up the van door to find the complete contents of the crockery cupboard all over the floor with broken glass everywhere. Not happy Jan. The rest of us found it highly amusing as this happens to all caravanners at some stage. The van was cleaned up and following Mick's instructions to the letter Jo then turned the fridge onto gas and lit it. That all seemed to go fairly smoothly until a fire ball erupted from the back of the fridge and then went out. Mick didn't mention anything about this!! We tried to light it again and again and the same thing happened. When you have a fridge full of food and no power this is not good. Knowing absolutely nothing about 3 way fridges did not deter me from pulling the thing apart in an attempt to find the problem. After an hour of fiddling with Jo in the background about to lay an egg, somehow the fridge started to work. Still not sure what I actually did. Then Jo went in to cook dinner and the stove would not work. So in I went again and after nearly dismantling the complete stove discovered that the glass top was not fully open, therefore stopping the gas flow. We don't have such things in our van!! So in she went to cook up a storm for her boys. Not long after out she bounds from the van wanting to know how long the new Waeco can run in the back of the car without flattening the battery. Days I told her, don't worry (I don't have a 12 volt esky so don't really know). Next day she jumps in the car and, you guessed it - flat battery! 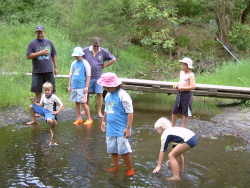 Now she is looking very worried as only last week while they were camping at Lake Monduran a fellow camper did exactly the same thing and had to have his car trucked into Bundaberg to get it started. The look on her face was priceless. I thought now was the time to administer Valium. Out came the trusty jumper leads and eventually the car started. Regretably for us the remainder of her trip was uneventful. Still a very good effort on her own. Priestleys turned up the next day without van in tow as the new fridge they were having installed was not finished. So reminiscent of a bygone era out came the tent. Now this erecting process used to take all day and then for another 3 days adjustments were made, with of course a few good family disputes thrown in. Well how disappointing. This trip the tent was up in 15 mintes, no arguments and no days of endless adjustments. How boring!! However we were not to be disappointed for too long. On night 3 just after the sun had set Ross and I were sitting near our van having a drink discussing some important issues(!!! ), when we heard a crash and a scream coming from the Priestley campsite. Fearing Michele had broken something Ross did a slow bolt to see what had happened. Then all I could then hear was Ross laughing, so I had to get up to see what was going on. On arriving at their camp was the sight of Michele lying face down across the large steel fireplace, stuck, in obvious pain and very upset. I must say I can see why he was laughing, and had a bit of trouble not laughing myself. Somehow in the dark she had forgotten this 4ft x 3ft x 1 ft high steel structure was in the middle of their site. She looked like a 'pig on the spit'. The funniest part was that because of the size of the fireplace and the way she landed, she was stuck, straddling this thing, unable to move. Of course did I have the video camera out? No. Well that bit of footage sent off to 'Funniest Home Videos' would definitely have funded the next trip. 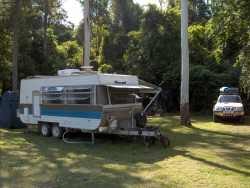 Saturday morning we packed up and headed off to Burrum Heads for a week. We refuse to go home as that would spell the end to our trip, so we unloaded a bit of surplus gear to both the Olivers and the Priestleys, as Christmas saw us accumulate a fair bit of extra junk. This is a great spot, be it a bit squashed in and very expensive. I have never understood why you have to pay a higher site fee if you have a waterfront site. Surely you use the same amount of water and electricity as people one site back. Anyway enough on my theories on greed. 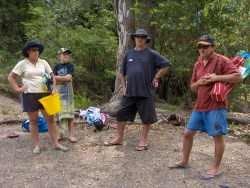 It was great to see the crew again as it has been 2 years since we last saw them (we didn't get to Burrum last year). The week was very relaxed and laid back which was good as our one week at home before recommencing work/ school will be very frantic. This same crew have now been meeting here for 11 years. We all worked together back in the early 80's on the Gold Coast and surprisingly, in this mad self- centered modern world that we all now live, we have remained friends. Other than a few extra grey hairs everyone has withstood the ravages of time well. So with 11 children in total there was rarely a quite moment but wow, did they have fun. Although the boys have a ball with tonnes of kids around I always feel a little left out as they are too busy to play games with poor old dad. One of the things we loved most about the trip was that for at least 50% of the time it was just 'us'. The family together doing all those 'old fashioned' family things like talking, playing games and generally being together. We had our traditional 'Christmas in January' complete with presents for the kids followed by Secret Santa for the adults. This always generates plenty of laughs and this year was no exception. Following the frivolity was the best roast meal imaginable. We had pickled pork, chicken, normal pork and every roast vegetable known to man, followed by hot Christmas pudding and custard. I could hardly move. So the last day of 58 weeks on the road was spent sitting and pondering about the year passed and the years ahead, gazing out over the beautiful Burrum River, often I must admit with a small tear in my eye. Not a tear of saddness or happiness, but a tear of gratitude. Gratitude that we as a family have had this opportunity, an opportunity that has changed us all forever, and completely refocused our attitude to life. It is also one that will remain locked away in our minds forever, an experience never to be forgotten, and one to be talked about for years. So Saturday saw us pack up again, this time heading for Bundy. The final leg of our journey around Oz. New Years Eve. It's a time that I normally sit and reflect on the year gone and the one about to begin. I personally never set 'New Year's Resolutions' as they should be something that is on-going and not just set once a year. It is for me normally a happy time, a time to relive all the fun and exciting times and to dream up new adventures for the coming year. This New Year's Eve was a very different one. Sitting back reflecting on the year just gone had me grinning from ear to ear. Words could not in anyway express the year that we as a family have had. The difference this New Year's Eve was that with all the happiness was sadness, genuine saddness, that the trip was about to come to an end. All the experiences, the laughs, the fun and the memories. The joy for Chris and I spending the whole time with the boys and watching them learning so much, and laughing even more. And who better to teach their own children than the parents, and teach not only school work but lessons from the biggest classroom in the world. The great outdoors. The things the boys have learnt and remember is the things that a classroom can't teach, nor would they try. The thought of slipping back into normality is not one that we, as a family are looking forward to. 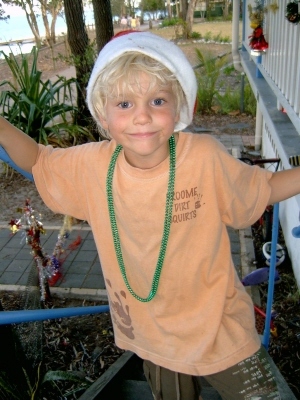 Dropping little Harry off to school as a just 5 year old for 6 hours a day, 5 days a week will break our hearts. It might be cheap babysitting and I am sure we will enjoy it, but is it the right thing to do. If we keep listening to Johnny Howard we will be starting school at age 3 and working until we are 90 years old. Is that going to solve any societal problems and more importantly is that living?? I will leave you to decide. As a family we have also grown. The main difference is that we have grown closer together rather than growing more apart that unfortunately often happens in our normal lives. I used to believe that you could send your kids off to school for 6 hours a day, work for 8 hours a day and only come together at night for a few hours after a hard day at school and work and 'grow together as a family'. I think I was dreaming. Don't get me wrong, I am not criticizing anybody or anyone's lifestyle and I don't have any simple solutions. What we as adults do have to accept is that the majority of society's problems with the youth of today rests on our shoulders. As most of us work harder and longer hours we obviously therefore spend less time with our kids. It's not rocket science. It all comes down to our 'Needs' and our 'Wants'. The more we want, the more we need to work to pay for it all. As a result we spend even less time with our children and often as a result our children's behaviour worsens. As the behaviour worsens the solution for some is to work even longer hours so we spend less time having to deal with this 'deteriorating behaviour'. That is what I call a vicious cycle. So as I have said before this trip for us has exceeded all our expectations. All of my concerns about the trip turned out to be unnecessary. The car went beautifully, the van perfect (had 2 flat tyres on the van that went flat overnight- no blowouts) , the weather great (less than a week's rain in 13 months) and the experiences we all shared could not be bought for any sum of money. If you want to do a trip like this and plan to come back the same person that you were before you left, my advice is don't go. We have all come back from our adventure very different to what we left. What's more, we are very happy about being different. If I had to sum it up in a few words it would be 'Don't sweat the small stuff'. The work politics, family hassles and any other worry that arises is all trivial crap. There is a much bigger picture. If only we could harness all that wasted energy that we spend on the small stuff. We would never need nuclear reactors and it wouldn't matter if we ran out of coal. The world would be powered forever more. So in total we were away for 58 weeks or 13.5 months. We ended up only coming home 1 week before we had to recommence work and school, simply because we didn't want it to come to an end. Over the past year we have been asked many questions about our trip, with many of these questions coming up time and time again. The most commonly asked question is "Would you do the trip again?" For those of you who have taken the time out of your busy lives to take an interest in our adventure will know the answer to that. In 'A Point to Ponder' which is currently on the cover page, I have outlined a number of reasons why doing a trip like this should be done while you and your kids are young and not waiting for retirement. Remember you can always do it again in the future, but you can't go back and do it again in the past. As we reminisce about the trip the smile on the kids face makes it all worthwhile. These are memories that we as a family will have forever. Would you get the same reaction if you discussed how many hours you worked last year and how much money you earned?? The second most asked question is "Which way should we travel around Australia, clockwise or anti-clockwise?" This is a subject that people have very stong views on. The reason is usually based around the wind and most say you should travel anti-clockwise. We travelled clockwise and had our fair share of both head and tail winds. In fact if you look at all the trees on the Nullabor and the way they are leaning then clockwise should be the preferred direction if you are worried about the wind. What time of the year and where you are going should determine the direction of your trip and not the wind. As a basic rule spend the summer months down South and the winter months up North. The next question is the most difficult to answer. "What was your favorite place?" We have visited hundreds of places and loved every one of them. In fact I can't think of one place that we didn't like. Everywhere is so different and needs to be enjoyed for what it is and not compared to others. Places like Kakadu that you hear so often is not worth visiting, was for us outstanding, and should not be compared to anywhere, simply because there is no other place remotely like it to compare it to. It is truely unique and to knock Kakadu is very Un-Australian. Places that really stand out are Lucky Bay near Esperance, absolutely breathtaking. Karrijini National Park near Tom Price is without a doubt the most outstanding National Park in this country. In saying that we were lucky to see it just after the biggest wet season in 10 years. Our timing was perfect and without question we saw it at it's best. Had we seen it last year when it was dry, I am sure our opinion would have been different. There are a few elements that determine how memorable a place is. The first is the weather and the second is the people around you at the time. You can visit the best place around, but if the weather is bad and the people around you unpleasant you will most likely leave with a negative image of your experience. The final stand out, must see highlight for us was Ayers Rock. This is breathtakingly magnificent as previously stated, and it brought a tear to my eye the first time I saw it. Ayers Rock is a place that every Australian should see. So a very difficult question to answer with the simple solution being, try and see them all. As with the previous question the next is also difficult to answer. "How long do you need to see Australia?" In my opinion you can't do it justice in any less than 12 months with 24, 36 or 48 months being even better. If you are going to spend close to $10,000 on fuel you really need the time to do it justice. Sure, we have met people, even families who have done the circuit in 3 months, but what have they seen other than the inside of the car? Even 6 months is pushing it. Australia is seriously a bloody big place. I think if you have anything less than 12 months for the trip you would be much better spending that time concentrating on a state or two, and not trying to do the whole thing. We spent exactly 6 months in WA alone, without getting there or getting back, and in that time only skimmed over it. So if I had 6 months and lived in Qld you could enter the NT from the South and exit from the North or the reverse depending on what time of the year you left. You would get to see everything without spending the whole trip in the car. The same could be said about NSW, Vic or Tasmania. My advice is to make the size of your trip proportional to the time you have. Another question commonly asked is 'How do you time manage the trip?' This is a good question because you don't want to find yourself back home still with 4 months of your trip left. On our trip we had no plans at all except what direction we were going. I must admit this was one of the issues that I had concerns about. My advice would be not to worry about your time management. It will work itself out. You will know when it is time to move on to the next spot and at the end of the day if you run out of time and don't get to see everything you planned, so what. That will leave you something to see next trip. Another option is to set a half way point, both in time and distance and work towards that, the downside of that option being that you now have a deadline, which sounds too much like normality. 'Should we take a tent as well?' Absolutely yes yes yes. Take all necessary cold weather camping gear as well as a 12 volt fridge/freezer with you (ie Engel or Evacool) of course with a second battery installed in your car. We didn't and very much regretted it. 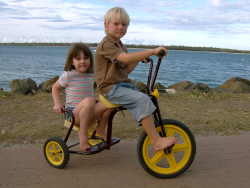 We ended up buying basic gear in Broome although we had much better equipment at home. If only someone had given us this advice!!!! There are many places that should not be missed that you are simply not allowed to take caravans in to. Camping is the only option. So despite what anybody else tells you, camping gear is a must. I must add here also, that all of our camping side trips were in 4WD country, and for us having the ability to go off road to see some of these amazing places was another real highlight. 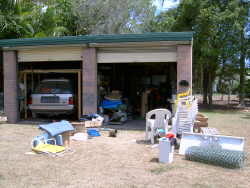 (Don't even consider the Kimberley's and some of the Top End without access to a 4WD) We bought a good quality box, put it on the roof of the car and stored it all there, ready for action. One of the things that has really stood out, as I have said previously is the number of young families on the road. There must be literally thousands out there all in different locations, travelling in different directions and at different speeds. It is a bit like the Ex Files. You are not alone. The vast majority of these people educate their children via 'School of Distance Education' with everyone we have spoken to being extremely happy with the schooling program and support given. This trip we choose not to do any formal schooling with Alex. 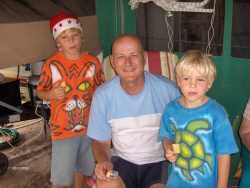 Harry was not due to start school anyway until 2007 and Alex completed year 3 before we left and will do grade 4 on our return. As he is an end of year birthday and was one of the youngest in his class this worked out well for us. In that year he read about 30 books and kept his maths skills up with different games and us asking questions that he had to calculate. Both the boys have also kept a comprehensive journal of the trip. Combine that with everything he has learnt along the way and he is miles ahead. We already had a very busy year and had we also included formal schooling to the trip, I am sure it would have been more stressful and a little less enjoyable. Allocated $250 per week for accommodation. Although this may sound expensive you must take into account the number of Kms travelled and what we did in that 58 weeks. We visited every tourist attraction and saw everything that we wanted to see. What also has to be calculated is what our expenses would have been if we had been at home. Certainly our diesel costs where higher but proberly only by 50%. Living expenses would have been higher at home when including school fees, uniforms, sports etc. Remember that you still need to eat and wear cloths regardless of where you are. As for Accomodation we are way ahead as the house was rented per week for more than we spent on accomodation. So while it is difficult to calculate exactly it it would appear that with all things, including the money made from renting our house considered we have actually spent less on the trip than we would have spent at home. Sounds like good value to me. For those people who are travelling on a longer time frame (24-36 months or longer) would be spending much less as the Klms travelled would be significantly less as would accomodation because you would stop at those nice free camps a little longer. One thing we really noticed is that you get much better and sniffing out quality free camps the longer you are on the road. The only time you need to pay to stay in a caravan park is when in a major town, and even then often there is a great free camp close by. So that is pretty well it for "The Parfitts 2006 Adventure". For us it was a trip of a lifetime. Not because we will never do it again but because it was our first big trip, and that alone held a special excitement. It was a once in a lifetime because we spent the whole year with Alex when he was 8 years old and when Harry was 4 years. That can never be repeated. Regardless of how much we travel in the future or for how long, this trip will always be special, very special. If anyone who has been reading this diary of our trip and has been inspired to do the same, then I have suceeded. If you have any question or require any advice please contact us and we will help in anyway we can. 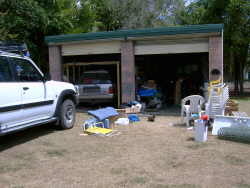 Our email address is brettparfitt(@)bigpond.com or mobile 0428305283. This web page will remain open and will be added to a couple of times throughout the year, but obviously not like it has been for2006. Thank you for taking the time to follow our journey, as that has made all the effort in writing it very worthwhile. I would like to leave you with my favorite quote that I wrote this trip. I think it sums it all up nicely. Think about it, before it's to late. Remember you can always do it again in the future, but you can't go back and do it again in the past. The sad reality- We are home.